Hormel Foods (NYSE: HRL) announced today that it has received several awards for its 2016 Corporate Responsibility Report. 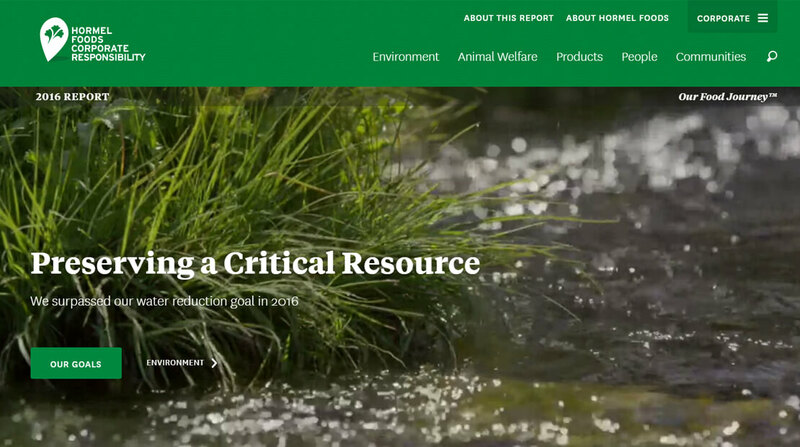 The company’s annual report provides information about the company’s goals and progress as a leading corporate citizen. The American Society of Professional Communicators awarded the company with a Colonial Award for Excellence in the best interactive online experience and best photography and graphic design categories. The company also received a W3 Award in the website features – visual appeal and general website categories. Surpassing its 2020 water reduction goal. In 2016 alone, Hormel Foods implemented projects that reduced water usage by 239 million gallons. Continuing the advancement of its safety and diversity and inclusion efforts. Having a record year for charitable giving, with $10.9 million in cash and product donations. Hormel Foods was ranked No. 8 on the most recent 100 Best Corporate Citizens List by Corporate Responsibility Magazine for its transparency and performance. For more information, visit the 2016 Hormel Foods Corporate Responsibility Report at https://csr.hormelfoods.com/.